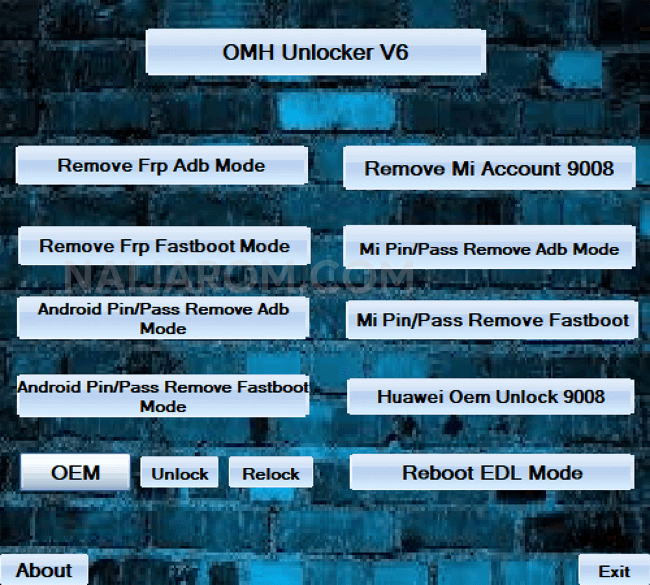 OMH Unlocker V6 is a small application for windows computer which allows you to remove the Android FRP protection using the ADB method, Remove the Android FRP protection using the Fastboot Method, Remove the Android PIN or Password using the ADB and fastboot Mode. It also allows you to remove the Xiaomi Account using the 9008 method, Remove the Xiaomi PIN or Password using the ADB and Fastboot Method, Unlock the OEM of Huawei Smartphone and Tablets using the 9008 Method, Reboot the Device into the EDL Mode, Onlock or Relock the OEM Lock on any Android Device. In order to use the OMH Unlocker, you need to install the Universal ADB Driver on your computer. Once Driver is installed, you need to connect your Android device to the computer using the USB cable. [*] Credits: OMH Unlocker V6 is created and distributed by OMH Min Htet (developer). So, full credits goes to OMH Min Htet (developer) for sharing the tool for free.